Burton Avenue Mobile Home Park was previously a mobile home community situated in Barrie, Ontario. In July 2013, the owners of the park decided to redevelop the property, serving an eviction notice to the Burton Avenue Mobile Home residents. The residents were given one year to relocate their homes and/ or find a new place of residency. The action was within the landowners’ legal right, but it would displace approximately 200 residents of the park, many of whom were low-income and elderly residents. 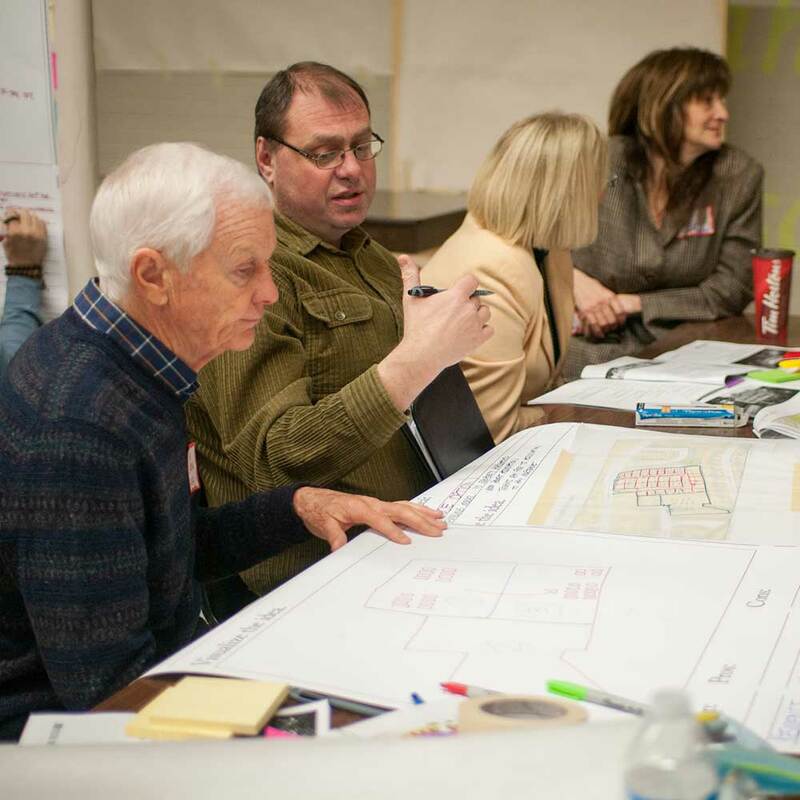 To fully explore the issues associated with the Burton Avenue Mobile Home Park, the residents approached the IwB and Susan Speigel Architects Inc. to organize a one-day intensive charrette. The event took place on February 8, 2014 at the Unity Christian High School, in Barrie. It brought together 67 participants including the community, Canadian Mortgage & Housing Corporation (CMHC), the city of Barrie and various other stakeholders. The residents of the Burton Avenue Mobile Home Park were facing eviction on July 31, 2014. 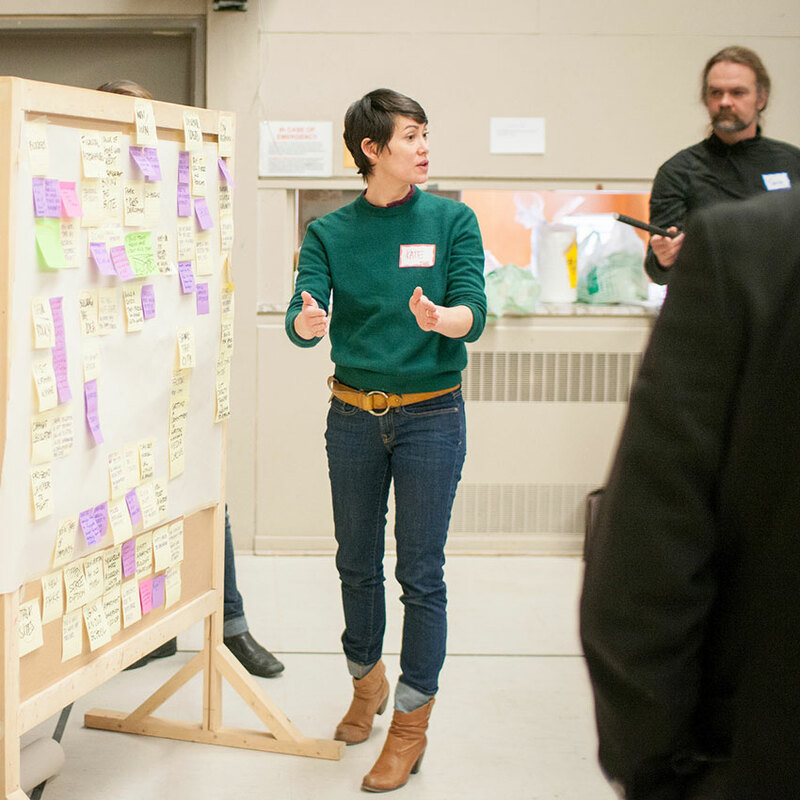 The primary intent of the charrette was to show the issues and concerns facing the community, explore affordable housing options and reduce the social and economic impact of eviction, by possibly delaying development or changing it. The solution associated with the Burton Avenue Mobile Home Park can become a precedent for affordable housing within Barrie and the County of Simcoe. The Burton Avenue Mobile Home Park was established in the 1950s by Victor Church. The Church family maintained ownership until 1988, when it sold the property to Dino Melchior and Joseph Vellinga. Since then, Melchoir and Vellinga maintained ownership, managing the trailer park. In 2013, the park consisted of 93 units that housed mainly fixed, low-income and elderly residents, providing non-subsidized affordable living. With a basic landlord-tenant agreement in place, residents paid rent for the land, which their trailers occupied, and for services such as water, hydro, etc. In July 2013, the landowners decided to redevelop the property, proposing 96 townhomes and a three-storey walk-up building. In anticipation of the approval of the development, they served an eviction notice to the Burton Avenue Mobile Home residents, allowing one year for residents to relocate their homes and/or find a new place of residency. In response, the residents formed the Burton Avenue Mobile Home Group and began reaching out to local councillors and neighbourhood associations for assistance. They also reached out to Susan Speigel Architects Inc. and the IwB because of their experience with the Twin Pines trailer park redevelopment in Mississauga. The eviction notice was within the landowner’s rights as stated in the Residential Tenancies Act, but it meant that over 200 residents would be displaced with limited time to find other housing. Local government officials have stated their concern in protecting the stock of affordable housing within Simcoe County, which at the time had a waitlist of close to 3,000 households. The Burton Avenue Mobile Home Park residents were not part of this list and there were great concerns that if solutions were not developed that these residents would lose significant investments in their mobile homes and risk becoming homeless. The charrette was to provide an opportunity for key stakeholders and existing Burton Avenue residents to provide input and inspire ideas for the future of the park, giving a venue for residents to voice their concerns and interests, and most importantly, stress the need for discussion about affordable housing options for the Barrie Area. The charrette teams proposed diverse solutions like hybrid development of the site with a portion dedicated to social housing; density transfer from the existing site to another property owned by the developer so that the trailer park could remain; a profit sharing model between the residents and the property owner; phased development and a possible two-year extension of the tenancy; integrated co-development and reuse of existing trailers and materials on site; as well as many other proposals. The IwB produced a report summarizing these key ideas and providing recommendations and options that could be explored in more detail, so that a solution that better mediated all the needs of the stakeholders could be developed. Ultimately, however, the development continued as planned and most of the residents of the Burton Avenue Mobile Home Park were evicted. They reached an agreement with the landlord, who agreed to pay $7500 as a settlement per property. The Burton Avenue Mobile Home Park eviction was a clear case of how drastically land use and development is changing in Ontario. The trailer park area was once a small and remote part of Barrie, but it became a sought after space for development. The case is not singular, but rather represents changing currents in land use, in which dislocation of vulnerable populations, unsuspecting of change due to long tenure, is becoming very common. 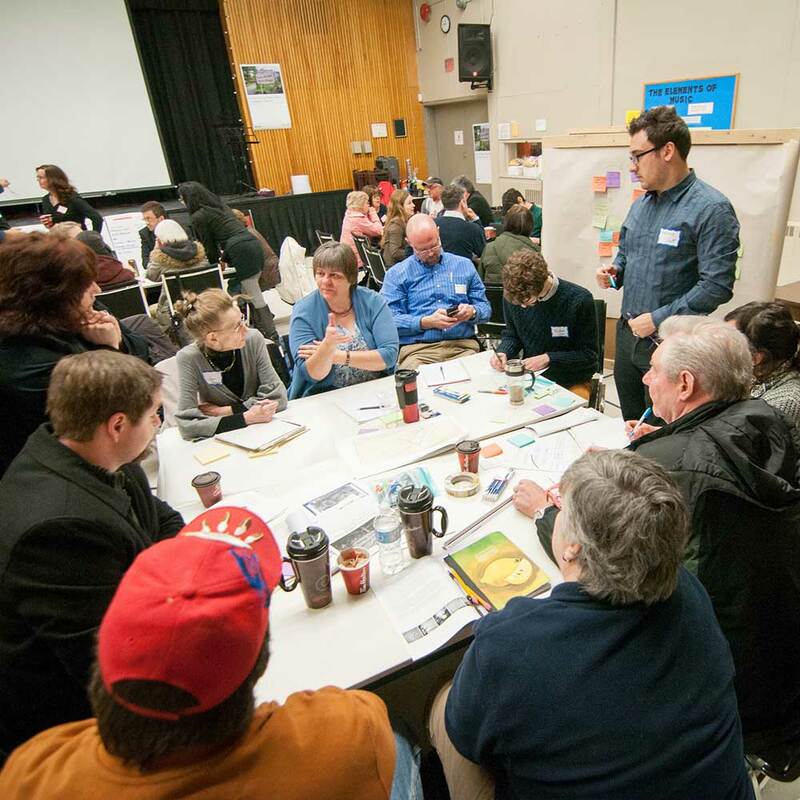 The charrette was a clear opportunity to face these issues and try to redefine how mobile home parks are dealt with as landowners seek redevelopment of properties across the province and country. Unfortunately, for all their enthusiasm and efforts, the Burton Avenue Mobile Home Park residents, were unable to convince the landlord to alter plans nor spur the necessary political action to promote their cause. The charrette started the conversation, but much more is needed to offset the pace of development and laws that bluntly favor displacement and large scale development.